The water crisis facing Uganda is well documented. Throughout the country, approximately 36% of the population lacks access to clean water. Poor sanitation and unsafe drinking water undermines public health and education efforts. Indeed, water-borne diseases is the leading cause of childhood mortality in the country In which infant mortality stands at 54 deaths per 1,000 live births and nearly 13% of the population dies before the age of five. ILF has been working in the region since 2006, having implemented two major programs, a sustainable energy program and a water/ sanitation program. 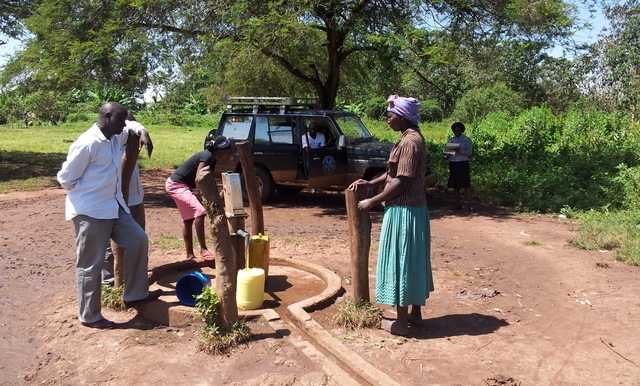 ILF produces all of its water points with its own drilling equipment and in- house staff. As a result, ILF has been able to dramatically reduce the costs of producing a borehole - about $7,000 to $9,000 per deep borehole. Since 2006, ILF has produced over 200 boreholes, which have benefited over 150,000 individuals. 75 deep boreholes produced will provide 75 villages with access to clean water. With an average of 500 individual per village, the program seeks to directly provide access to clean water to 37500 people. Through the creation of Community Health Clubs (CHC) and training 30 Community Health Workers (CHW), each household will receive in- depth education/awareness to the importance or clean water. Ensuring that all individual near clean water points will also receive comprehensive sanitation and hygiene education. These households will also be receiving training to build latrines. AfricaAHEAD will be responsible for launching the CHC component of this project - which includes training and community organization. Given economic/geological conditions, deep boreholes are the most cost-effective option for bringing clean water for the region. If properly constructed/maintained, such boreholes have a 10-20 year lifespan, A GETF survey has shown that ILF's shallow boreholes from 2006/07 had a sustainability rate of 85% in mid-2012. This suggest that a 10-20 year lifespan for the deep borehole ILF would produce for the program is achievable given that: (1) deep boreholes last longer; (2) ILF has substantially improved its methods since commencing operations in 2006-07; and (3) experience with CHCs demonstrates their effectiveness in improving water point management and hygiene/sanitation practices. Phase 1 was successfully completed in Palissa, where ILF produced 6 deep boreholes near/or at 6 health clinics, providing clean water to over 7,000 individuals. This program is Phase 2, which will only focus its efforts in Apac District. Boreholes are an accepted form of intervention in Apac society. Improved hygiene/ sanitation is a need that thought out by communities in the region. ILF has partnered with AfricaAHEAD to establish Community Health Clubs the clean water sites, drilled by ILF. CHCs use attention to social norms and community engagement to build commitment. Membership is voluntary, free and open. Members can join at any time, debate and be art of all decisions. CHC encourage all household to participate in hygiene/sanitation behavior changes training, allowing them also to understand the importance of clean water, this also encourages all village households to work together in maintaining the water point and ensuring its sustainability. Improved hygiene/sanitation is a national/ local government goal. ILF works with local governments to ensure that the selected villages are prioritized by need, to ensure that those most in need obtain assistance first. ILF also woks with the national government to ensure that ILF works within the national WASH standards set forth by the Ugandan Water Ministry. Future activities that ILF seeks to implement through the H2O+ initiative will be to introduce a micro-enterprise venture of fuel-efficient stoves. ILF's objective at this junction will be to provide capacity building training of fuel- efficient stove producers and vendors. As a results new income- generating activities will be introduced to the region. Water User committees (WUC), Community Health Workers to conduct regular on-site visits by WUC and periodic on-site visits by ILF. Data collection, evaluation and training staff to use BPN's text-messaging tracking tools to collect and transfer data. Visits will be undertaken by monitors who will report on indicators such as, water usage/flow rates, borehole conditions, latrine coverage, hand-washing facilities/practices, clinic visits and school attendance. Each borehole will be visited at least once within the first year after completion and all data/evaluation markers pertaining to program performance willbe collected. The boreholes will continue to be monitored over a 3-year period. These are funds that have already been secured for the program. Each community receiving a borehole will contribute about 5% to the maintenance and repair costs. The funds collected at the community level will be managed by the Water User Committees' treasurers. Also through the community health clubs, community members will obtain greater awareness of the importance of their contribution and how these contributions will help their community as a whole in improving their daily livelihoods, by ensuring they have continuous access to clean water, and improved sanitation/hygiene practices. I may be missing something, but I have not come across details of the means by which the water is pumped out of the boreholes and made available to the population. Hello Carmen, all of ILF boreholes are equipped with either U2 or U3M handpumps. For this particular project we will be focusing in implementing U3M hand pumps for all the boreholes. Thank you for the answers to the previous questions. Looked into ILO's facebook account and saw some pictures and videos too. Everything looks great at the time of installation. Your website says "Over the past five years, Lifeline has completed over 220 boreholes ........... Lifeline’s water program has provided clean drinking water to approximately 150,000 individuals at a cost of $8.00 a person". Do you have the geographical coordinates/ geocodes of all these 220 boreholes? You have mentioned that your organization will start using the sms system on BPN's PWX platform, When do you have plans to start texting because 94 of your projects, all of which are recorded as 'complete- successful', are already on the PWX site? If the number served to be the same or increased years after installation then you should get funds and keep expanding. Tracking is important because things just don't work the way it should once the implementer moves out from the area. Thank you for your question. Over the past year, ILF has ensured that all its boreholes have been provided with geographical coordinates, which have been entered in an ILF master database. This database will assist ILF's WASH program when it will be time to implement the SMS system. We are currently still seeing with BPN how ILF will go about setting up the SMS system, and cannot provide an exact timeline as to when this is be completed. We hope that in the early to mid part of 2014 this will be completed and functioning in Uganda. As ILF moves forward with it's WASH program, it is ensuring that a systematic monitoring of all its boreholes are conducted (100% of the 2012-13 boreholes and 33% of the 2006-11boreholes. ILF is continuously working to ensure that its WASH program can continue implementation as well as expand as to reach as many beneficiaries as ILF's capacities can reach. Hello ILO.....It is great to see that you have a lot of experience drilling wells, and its nice to know you can keep the drilling costs to a minimum owning your own drilling rigs. Nicely done!! As you've made clear in your proposal, it is vital to have education and follow up to ensure the wells continue working long after you are gone. Your have mentioned the CHC's which you set up to help promote health and hygiene in the communities. You also talk about the WUC's but haven't clarified who initiated these groups. Are these already in existence, or government initiatives, or are these groups also set up by ILF? As the WUC is in charge of receiving funds to maintain the well, who then does the maintenance. Are there trained well repairmen provided by the government, or does ILF also train repairmen to keep the wells functioning? If so, how much training do they receive, what type of support does ILF give them,...for how long... and are spare parts available in these areas to repair the wells...or does ILO have to provide them? CHC's: Are the CHC and CHW personnel paid by ILF, or are they volunteers. How do you monitor their work, follow up, household visits, etc. to ensure they are actually providing these services to the recipient community? Looks like a good project and I look forward to your responses. Thanks for sharing this proposal. Like Paul, I have a question about long term maintenance and sustainability. You mentioned in your proposal that the boreholes will be monitored over 3 years. What happens next? It is often seen in this type of project that the main challenge is maintenance after 5 years or more, so I am wondering what measures ILF plans to ensure that the boreholes will remain in good conditions. I also would like clarification on measures taken to avoid recontamination of water once people get it from a borehole. In our safe water supply projects in Cambodia and Madagascar, we have seen that a critical issue is water transportation and storage, which, if done in bad conditions, leads to recontamination even though water was clean in the first place. How is this issue taken into account? The WUC is a community based organization that is filled by all volunteer positions, required by the national government for all improved water sources and created by the implementing organization (e.g. ILF or district govt). ILF facilitates election of the 7 member WUC through a community meeting. All WUC members belong to the community in which the BH serves. As part of WUC training the WUC is responsible for collecting user fees, which generally are 1000 UGX per household per month. The fee is established at a community meeting run by the WUC. The Health Assistants at the Sub-County level are responsible for overseeing the WUC. In regard to maintenance, both the WUC and the hand pump mechanics preform aspects of it. The WUC and specifically the care taker is responsible for the condition of the borehole area include the fence, soak pit, keeping animals away and keeping the area clean. The caretaker works with the users to accomplish this. The hand pump mechanics role is to conduct assessment and repair the mechanic aspects of the hand pump. Currently, each Sub-County has a trained (either by govt or NGO) hand pump mechanic and the necessary tools which are hired to perform borehole repairs. ILF does not train hand pump mechanics at this time, but have provided a few sets of tools to districts as part of previous projects. As Lira is a sizable town and a regional trading center there are several hand pump parts suppliers that the the hand pump mechanics can purchase their needed parts from. ILF guarantees its work for a full 6 months against defects of supplies and equipment, but does not provide spare parts for repairs. ILF's WUC training includes two parts including Borehole Management and Sanitation and Hygiene. The Borehole Management includes all aspects of operations and maintenance. The Sanitation and Hygiene training includes sanitation ladder, ideal household, hand washing, safe water chain and is taught using PHAST tools. The WUC training is 2 days in length. As for the the CHCs, ILF is currently working with AfricaAHEAD on creating the CHC curriculum and implementation strategy and do not have detailed information to provide at the moment. However, based on previous CHCs implemented by AfricaAHEAD, the CHC/CHWs are regularly monitored through their bi-monthly/monthly trainings by the ToTs (AA consultant and ILF staff) on the weekly sanitation trainings the CHWs are to provide to their communities. In addition, ILF will be conducting borehole monitoring at each site to monitor the functionality of the borehole, and the WUCs, ILF plans on monitoring the impact of the CHWs in their communities as well (year 1: first visit is done approx. 1 month after completion of borehole, than 10-12 months after borehole completion. Afterwards, ILF seeks to visit each site once a year thereafter for the following 2 years. ILF monitoring strategy is conducted over a three-year period – this provides both the communities as well as ILF a timeframe to ensure that all tools and practices are understood and implemented so as to allow each community to take full responsibility of the boreholes. After 3 years, ILF will no longer monitor those boreholes systematically, however, ILF will continue to conduct sporadic visits to boreholes older than 3 years. In addition, through the relationships established over the years with the communities, the WUCs, the VHTS and the Local council, ILF has the ability to remain in communication with those responsible of each borehole site, and if there are major issues concerning the maintenance or functionality of the boreholes, ILF is able and willing to assist these communities. As for the measures taken to avoid recontamination of water – this is a challenge that ILF continues to face, much like all others working in WASH. As ILF moves forward with this project, the measures taken to minimize this possibility, is the establishment of the CHCs, which is a 20-week sanitation and hygiene community training activity that will be implemented at each borehole site. The CHCs work directly with the households on a weekly basis, with in-depth education/awareness session of good sanitation and hygiene practices, which provide each community household the tools and knowledge to make the necessary changes that will benefit their health through access and maintenance of clean water – not just at the water sites, but in their households. In addition, ILF is working with Africa AHEAD, pioneers in the implementation of the CHCs, with an excellent track record of increasing good sanitation and hygiene practices at the household level in Zimbabwe, Rwanda and Ethiopia. ILF believes that this is minimized these types of challenges that we have faced over the years and strengthen our current WASH program for sustainability in the regions ILF works in. This is a very large-scale program with a significant water impact- congratulations on this enormous effort. The total program cost is $724,000 and you have $475,000 in co-funding and are requesting the remaining $250,000. In the co-funding details, it seems like you are operating off a general cost per well of $6,500. However, in the funds requested for the remaining 14 boreholes, the cost per borehole is close to $18,000. Can you help explain the difference between the co-funding sub-programs and the activities that the funds requested will support? This is great! how wonderful that you have all the equipment to dig boreholes and have a very thorough WASH Education program. I see that you have some considerable community contribution which is great. I was curious about how involved the government will be. Will there be any contributions coming from them? Will they be more involved in data collection and tracking health improvements? How will their involvement be funded? The funds requested are not only to over see the drilling of the 14 remaining boreholes but also to assist in the implementation of the Community Health Clubs (CHCs), currently the overall co-funding sub-programs have enabled ILF to ensure that 61 of the 75 boreholes construction will be funded and completed – however, most of that co-funding does not cover the majority of the costs for the CHC implementation part of the project. The funds requested are to ensure that the CHC portion of this project is fully funded and will enable a total of 59 CHCs to be fully implemented in addition to the drilling of the remaining 14 boreholes. ILF works closely with the Local District Offices in each district it has worked in since 2006 and has been able to establish a good working relationship with the Apac local council. This has enabled ILF to work closely with each community and establish good Village Health Trainers (VHTs) who are local government employees and are responsible for the monitoring of communities to ensure that some of the basic sanitation components are undertaken, such as latrine construction, and rubbish pits. The VHTs, as part of the government, are responsible for collecting health data and tracking health improvements throughout the district. The government funds the VHTs. Following up on Julie's question, i assume you have raised $475k with a more detailed budget than you provided here. Esp. for sanitation. Is there any amount for monitoring (is there more details for the $58k for maintenance)? Can you please share those documents/information? Christine, thank you for your reply to my budget questions. Does this mean that if the funding is not raised, the majority of boreholes will be drilled without a CHC being trained? Or will you wait to drill the wells until you are able to train a CHC at the same time? When you describe AfricaAHEAD as a partner in establishing CHCs, I take it that they are not supporting any of the costs? What is their role in the partnership? Also, as Rajesh is asking for a more detailed budget, I am having trouble with the numbers provided. How much are you estimating each borehole to cost and how much for each CHC? I am having trouble seeing where these fit into the budget you included. Lifewater works in Lira District, very close to where ILF is working. We have found that the VHTs need a significant amount of additional hygiene and sanitation training, as well as frequent follow-up to be truly effective at improving community health and hygiene. Do you provide any training and follow-up for VHTs or have you found them to be self-sufficient? I apologize for the long list of questions, but especially with Lifewater's work in the region, I have very curious to understand and hopefully gain insight from your program model. As both of your questions are similar, I will answer both at the same time. Africa Ahead is a consulting firm who are the leading expert on the developing and implementation of CHC, having successful programs in Zimbabwe, Rwanda and Ethiopia. They will not be contributing financially to this program, but work closely with ILF to implement the CHC (sanitation and hygiene focus) component of the WASH program in Apac for ILF. This will enable ILF to reinforce and ensure a holistic and high quality sanitation program that will increase the communities, WUC and VHTs abilities and willingness to practice good sanitation and hygiene practices. ILF believes in this project, and will move forward in its activities whether or not we are able to receive the full requested funding at the moment. ILF will ensure that all 75 boreholes are completed within the given timeframe, which will include setting up the WUC and VHTs as well as work with Africa Ahead in implementing the CHC - ILF will seek other venues to cover the remaining costs and will proceed with its activities - if needed, will hold the CHCs until funding is available to return to selected sites to implement the CHCs at a later date. We did not receive a reply to our question regarding long term maintenance and sustainability (i.e. beyond 3 years), therefore the conditions are not met to express a strong opinion on this project. Cost efficiency seems like a strength of this intervention as it allows wide coverage in a region where water needs are critical. The community-based component is key and detailed information on the invovement of beneficiaries as well as local authorities would have been highly appreciated (technical attachments could have been provided for instance). Finally, the experience of ILF in the area is definitely an important aspect, which will surely allow addressing the durability challenge, both in financial and technical terms. I feel that asking for our rating for this review may be a bit partisan as Africa AHEAD is partnering with ILF on this project. However I have confidence that the project design is going to succeed, as apart from the importance of ILF providing these boreholes, we at Africa AHEAD can guarantee high community understanding for the importance of protected safe drinking water, which in turn will ensure ownership. Our experience to date shows that using the Community Health Clubs to moblise community for good hygiene is one of the most effective methodologies to ensure sustainabilty, not only the infrastructure, but also most importantly the hygiene behaviour that will compliment the safe water and prevent disease. Although this is the first time we have partnered with ILF I am confident we will be a strong and complimentary team. Although the discussion has been mainly on hardware if anyone wants further clarification i can engage next week. I regret not being online over this period as have been travelling but will be back at my desk next week for any questions. I am submitting this response in case I miss the deadline for the rating. This is a very large scale project with a significant potential benefit. Yet the proposal itself is remarkably undetailed. I like Christine's responses to questions, but I feel the proposal needs to be improved. This is an excellent project but seems to have a lot of additional committees and groups that often make coordination difficult in the long run. Never the less, wells are sorely needed and hope the ILF follow up teams will ensure sustainability of the project. I would recommend supporting the project in part, or full if the funds are available. As a partner in this project, BPN's ratings may be a bit more biased (though a bias has been built thru 8 years of peer review with many of the peers). The Q&A clarified many of the missing parts of the proposal, which could have reflected the size and depth better. Their rigor needs to be demonstrated better on their earlier projects. This is a huge project with a huge budget. I hope that they can find all the money to fund it and can ensure that the education and monitoring and evaluation is not compromised if all the money is not raised. The program is very large and seems well thought-through, with intentional efforts put in to encourage sustainability. My concern is with the vague financial details and lack of a clear budget. Especially with such a large request, I am uncomfortable giving a high rating without understanding clearly where the money is going. Whether in India or in Uganda monitoring should be done every six months after establishing the project is running smoothly. It is worth spending funds on monitoring and renovating or reviving historical projects than obtaining funds to expand showing the theoretical numbers and impressive photos with theoretical reports. The detailed budget is missing. It seems a lot of its expenditure is for forming groups and training. May consider establishing the use of metrics on PWX that would eventually enable auto-tracking.